“Internal Citizenship”, Russia and RUnet: 2,000,000 virtual passports : Non-profit research based consulting "Sreda"
From March 2012 to May 2013, more than 2 million people took part in the RUnet online-game “Internal Citizenship”.During the game the participant is invited to answer 31 questions and compare his answers with the answers of people in European countries. Which citizens of European countries do the RUnet-users resemble? What distinguishes Russians from Russian Internet users? What values and socio-political views unite the inhabitants of the real and virtual spaces? And finally, how can “game” methods be used to explore identity? 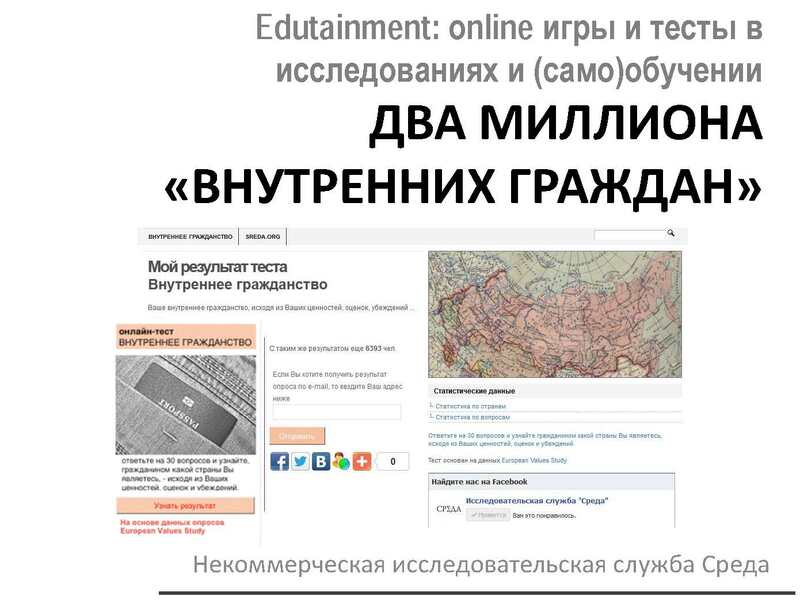 – The coordinator of the organization “Sreda”, PhD, Alina Bagrina, spoke about this study in a press conference on 10 June, at the House of Journalists. The game “Internal Citizenship” was developed by the organization “Sreda” on the bases of the data from an international study called European Values Study, which has been conducted since the 1970s, and concerns all aspects of life – family, work, religion, politics, and society. The most recent wave of the study (2008) includes 47 countries from Europe, including the Russian Federation. 1. Do you participate in demonstrations? 2. Do you trust the government? 3. Do you trust political parties? 4. Do you trust the UN? 5. Do you trust the judicial system? 6. Do you trust the health care system? 7. Do you trust the army? 8. Do you trust the Church? 9. Are you interested in politics? 10. Do you participate in elections? 11. Do you believe in God? 12. Is God important in your life? 13. Do you have an interest in the supernatural? 14. Do you visit a worship service at least once a week? 15. Do you believe in the existence of a personal method of communication with God and the saints (not through the Church)? 16. Is it important for you to have spare time? 17. Is work important to you? 18. Is salary important to you? 19. Are you satisfied with your job? 20. Is it a responsibility to society to work? 21. Do you believe it is fine to live together without being married? 22. Is it a responsibility to society to have children? 23. Is it important for children to learn their family’s faith, and to get religious upbringing? 24. Do pre-school children suffer when their mother works (is absent)? 25. Are growing numbers of immigrants a threat to society? 26. Do you trust the people around you? 27. Can abortion be justified? 28. Are you proud that you are a citizen of your country? 29. Can nature cope with what industrialized countries are doing? 30. Would you be against having gay neighbors? 31. Could a person taking a bribe be justified? Who participated in the game? During the year, there were more than 2 million unique Russian-speaking Internet players in the game. 55% of them were women, and 45% were men. 76% of participants had a complete or incomplete higher education, or a degree (RUnet is “more educated” than the Russian population as a whole). 19% had secondary education, and 5% did not indicate their level of education. Men were generally more likely than other online players to get to Bulgaria, and women – to Greece and Hungary. Those with a higher level of education were more often citizens of Greece and least often of Turkey. How do online Russians differ from the average Russians? If we compare the responses of the “paper” participants of the nationwide representative survey conducted by the «European Values Study», to the answers of RUnet users, we can note a big difference. Inhabitants of RUnet are in general less likely than the Russians to trust public institutions and the Church. (Trust in the government: 60% of Russians and 20% of online Russians; in the Army: 73% and 43%, respectively; and in the Church: 67% and 34%). RUnet-Russians rarely are proud of being citizens of their country: 59% vs. 91% of Russians. Those most distrustful of public institutions are RUnet-Russians with higher education. However, despite having a distrust of institutions, residents of RUnet demonstrate a high level of trust in the people around them (60%), the show figures close to residents of Finland, Switzerland and the Netherlands. At the same time, according to the EVS, only 29% of Russians as a whole trusted people around them. 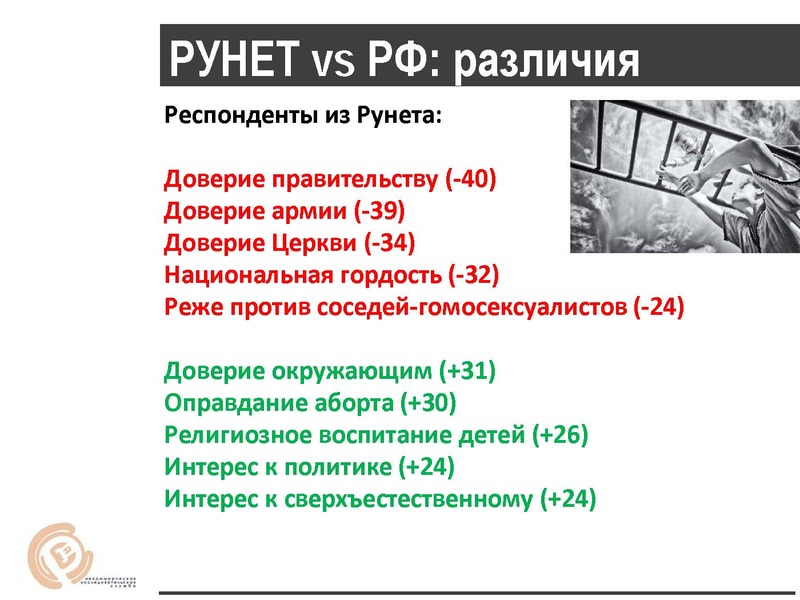 Interest in politics is higher among RUnet-Russians than among “Russians in general” (61% and 37%, respectively), but RUnet-Russians go to the polls less frequently. The number of participants in the game “Internal Citizenship” continues to grow. We hope that this will allow us to repeat the analysis of the data, and to see the dynamic of the values of the Russian Internet audience. New socio-games in the public domain! Continuing research into identity with games based on sociological data, the organization “Sreda” offers the Russian equivalent of “Internal Citizenship”: “: the game “Internal Residence” , that compares the participant’s answers with the answers from 56,900 Russians (data from an all-Russian representative survey: : “Atlas of religions and nationalities of the Russian Federation “). ). Upon completion, the player receives an emblem of the region who’s inhabitants are the most similar to them. Self-educating tests “Features of National Identity” and “Peculiarities of the National Religiousness” ”, are based on all-Russian representative surveys from 2011-2012, and offer participants the opportunity to compare their assumptions with the real picture of public opinion in Russia. Finally, the test “Degrees: Civil-Spiritual Scanner” invites participants to answer 20 questions about their civic and spiritual orientation and discover what their “civic and spiritual temperature” is compared with the average Russian.